Another excellent release from prog master Dan Britton (Deluge Grander, Cerebus Effect, Birds & Buildings). All Over Everywhere is Britton on keyboards & guitars, Trinna Kesner on acoustic guitar, violin & viola, Natalie Hughes on cello & bass guitar, Jennifer LaPlatnia on piano, accordion & vibes, Kelli Short on clarinet, flute & oboe, Ignacio Cruz on zither, dulcimer & electric guitar, N.Scott Robinson on percussion, Pat Gaffney on drums and Megan Wheatley on vocals. The musical textures are multi-layered, lush & symphonic and Megan's vocals are angelic! There is a certain "psychedelic" feeling in some places, not unlike early 70s Pink Floyd. The arrangements focus on atmosphere and creating an otherworldly bed upon which the various instrumental colors can play and dance. And, for those who live for it, there is a lot of mellotron. Certainly there are shades of early Genesis & King Crimson woven into the musical fabric of All Over Everywhere, as well as the aforementioned Pink Floyd, but the overall effect is something quite unique especially for an American artist. The CD is superb from beginning to end without a weak moment anywhere. This is one that will stay on my playlist for months to come! Comes with a free sampler of Dan's other releases! 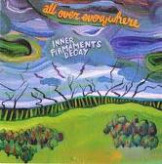 Notify me of updates to All Over Everywhere "Inner Firmaments Decay"